Convergent evolution? How much convergence? Let's assume that Mars evolved independently on Mars from Earth but that Mars was similar to Earth when life evolved. How much convergent evolution would we see? My own view is that there would be a lot. A land creature needs good vision. So good stereoscopic vision seems v. likely to evolve. The actual structure of the eye may be less important than its function. You might think it makes no difference whether your mouth is above or below your eyes. But if your mouth is above your eyes, then bacterial laden slobber will - thanks to gravity - make its way into your eyes, potentially causing you infection and rendering you defenceless. So surely natural selection will always, but always favour eyes above mouth in land animals. Interestingly, although we've lost quite a lot of facial hair, we haven't lost our eyebrows - showing again the importance of protecting the eyes. Would bipedal motion always evolve? Hmmm...not so sure about that. Gorillas, chimps and orangutans are all highly intelligent but prefer to move quadrapedal style when on flat ground. But that wouldn't necessarily in my view rule out further evolution. Shakespeare could have moved on all fours when he went to the local tavern before he sat down to compose a new play. But something like digits are definitely going to be required at higher evolutionary stages for land based animals I think. Snake, slugs and snails aren't going to make it to the higher levels because their ability to manipulate the environment and create tools will be strictly limited. Multiple tentacles seem pretty efficient in the ocean but are probably not so great on land as would require a huge amount of energy to keep aloft when not supported by water. I presume that's why we don't see tentacled land creatures...so that also implies that a minimal number of limbs - with only two being used "off the ground" is probably something dictated by the energy budget available to land animals. However, Mars has different climate conditions/gravity from earth, so I believe if life were to exist/(existed?) it would not be quite the same. We know meteorites have passed between Earth and Mars and vice versa and that bacteria can survive extreme conditions (being thrown space in a chunk of rock would not be enough to kill them). So it's quite likely even if life didn't start on Mars, it could have travelled from Earth to Mars and survived. 4.4-million-year-old and we are trying to look into a past that is around the 3 billion year mark of planet formation some where around 5 billion. With the data of cooling for mars we can align the time lines if the same life begining process happened or from the same seeding source. It is a guess that says water is a necessary ingredient to life so when Mars got water is important for the aligning of what happened on earth until mars goes dry. Nice visuals Spacenut...it certainly seems like there could have been an opportunity for Earth to seed (water-dwelling) life Mars between 3.8 and 3 billions years ago. That's a long period of opportunity: 800 million years during which many Earth-origin meteorites would be hurled to the surface of Mars. Also, clearly, it is not impossible life start on Mars and seeded life on Earth around the 3.8 BYA mark. Let's get to Mars and find out. If life on Mars did truly evolve separately, we would see some very fundamental differences. Here on Earth, DNA is the molecule that encodes proteins and genetic characteristics. Only 4 nucleotides are used to encode information: 2 purines and 2 pyrimidines. But there are more. RNA takes less energy to make, but is easier to break. Many single cell organisms use RNA as its gene carrier. Large multi-cellular organisms would evolve DNA because it's more stable. But RNA has one different nucleotide than DNA, demonstrating that other nucleotides are possible. All life on Earth uses the same coding sequence for amino acides, indicating a common source of life. 3 nucleotides have 4^3 combinations, eliminate mirror copies and you have 4^3/2 = 56. These encode only 20 amino acids; there are several different combinations to encode the same amino acid, and several combinations are used for "punctuation" (start, stop, etc), and several combinations simply not used. There are more than 150 amino acids in nature, why only 20 encoded? If 3 base pairs were used, then DNA could be encoded with pairs instead of triplets. This would be more dense, but makes matching transfer RNA to messenger RNA at a ribosome more tricky. Six nucleotides (3 pairs) would be more efficient for large organisms with a lot of genes, but not for single cell organisms with much fewer genes. It's entirely possible more than the 4 nucleotides we know developed, but were down-selected. In a different evolutionary system, a different basic biochemical system may have evolved. Starting with different DNA would have profound influence over evolution. Our DNA has genes that are very hard to break, extremely stable. These encode basic functions that all cells need to function. Other genes are easier to break, more susceptible to random mutation. 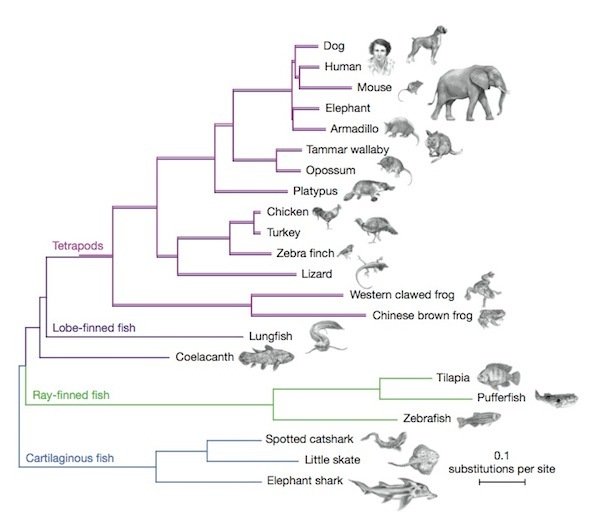 These are genes that encode length of a nose, length of limbs, other morphology that makes one species different than another. This enables evolution. How would that work on another planet? On Earth, insects populated dry land long before any other animal. At one point, fungi such as mushrooms had not evolved yet. That mean wood could not rot. When trees died, logs would lie on the ground with no means to return to the soil. A layer of logs would build up in the forest until they were buried. Pressure and heat of trees buried deep underground converted them to coal. That's where all the world's coal comes form. Now that we have fungi, wood rots long before it gets buried. That means coal no longer forms. Oil does, coal does not. But when insects ruled and trees would not rot, Earth's atmosphere had much more oxygen. Dead trees sequestered carbon from the atmosphere. This high oxygen allowed insects to grow very large: dragonflies with 3 foot wingspans, centipedes more than 6 feet long. Insects do not have lungs, they breathe through pores in their skin/carapace. They receive oxygen directly into tissues through absorption across membranes in these pores. The largest insects today are as large as they can grow with today's atmosphere. If insects had evolved lungs, they could have grown as large as mammals. Conditions on Mars never were exactly the same as Earth. It was warmer, did have a thick atmosphere with rain, rivers, streams, and an ocean. But it never had plate tectonics, so more stable geography with fewer earthquakes and volcanoes. Gravity lower, temperature colder, atmospheric pressure much higher than today but still less than Earth today. Looks like Mars never had an oxygen atmosphere, so rain in a CO2 atmosphere meant rain was weak carbonic acid. Rivers and streams would also be weak carbonic acid, which meant accelerated weathering of igneous rock. Earth would have had that too until an oxygen atmosphere was created by cyanobacteria. How would that affect evolution? No large animals on Mars, Louis. Their energy requirements mean they need to take in Oxygen on Earth and would almost certainly need some equivalent energy supply elsewhere. The vast majority of life on Earth is single celled. Bacteria and/or Archea are everywhere we have looked, and these types are what I would expect to find on Mars, IF any life is found at all. In that unlikely case, I think there will be a good chance that that life will share a common origin with Earth life. The only surefire law in Biology is that of Evolution by Natural Selection. RobertDyck gives a good overview about how life would be quite different on Mars. I myself believe that the vast majority of life on Mars would be prokaryotic like on Earth, especially given the frigid and anoxic conditions of the planet, which both make complex life very unlikely, even in the past given that complex life is less than a billion years old on Earth, at which times Mars was perhaps what it was today. I really liked Roberts post. Some say that Mars did have an Oxygen rich atmosphere at one point. As for lack of fungi and coal deposits. I am OK with that, however I wonder about thunderstorms, lightning, forest fires, and a very high Oxygen atmosphere. I am not disputing that the coal may have come from unrotted buried trees, I just am curious about the role of forest fires in the presence of a very Oxygen rich atmosphere. I am curious about the Oxygen atmosphere thing. I have posted about it before. I guess my name must be being interpreted as "Avoid". Science is at attempt at finding truth, so I am helping if I can. Whoa! Mars had an oxygen atmosphere? Oxygen does not form naturally in significant quantities. Earth's atmosphere is primarily nitrogen/oxygen, which react with eachother. You would expect Earth's atmosphere would become some form of nitrogen-oxide. Lightning combines nitrogen with water to form ammonia, which falls to the ground and gets washed by rain into soil. Bacteria convert that to nitrate. But lightning also directly combines N2 with O2 forming NOx. If oxygen were not actively generated, it would have fallen to trace levels long ago. Mars currently does have oxygen (O2), but it's a trace gas. The Guardian article claims Mars had significant oxygen. If that were true, something had to actively generate it. Earth and Mars have been swapping rocks for as long as they have been planets. This is caused by an asteroid whacking the planet, throwing rocks into space. Some of those rocks orbit the Sun until they fall somewhere. Some will fall back to the planet they came from, but some do fall on the opposite planet. Mars meteorites have been found with structures that look like fossilized bacteria. And they're inside the rock, implying they got there before entering Earth's atmosphere. The two planets could have exchanged bacteria and archaea this way. The article claims Mars had an oxygen rich atmosphere 1.5 billion years before Earth. That is Mars had an oxygen rich atmosphere 4 billion years ago, while Earth's atmosphere became oxygen rich 2.5 billion years ago. Did cyanobacteria come from Mars? Different folks claim different things. Point is, it's a claim, not a fact. Mars may or may not have had an oxygen-rich atmosphere 4 billion years ago. Who knows? But I doubt it, based on Earth's apparent history. Does the oxygen rich atmosphere really matter? Land based organisms on Earth didn't emerge until perhaps as late as 400 millions ago. So we are talking about water dwelling organisms aren't we if we are talking about opportunities for Earth-Mars life exchange? 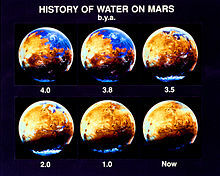 And isn't Mars water going to be pretty much the same as Earth water way back when? Don't think we can reject the notion of large animals out of hand. We know some organisms on earth don't need to breathe - they can metabolise oxygen from iron oxide...who knows? - perhaps they originated on Mars! In principle we can also imagine organisms that can breathe oxygen from water - like fish... Ice is another enivironment where organisms could survive. There might be environmental niches on Mars that have survived for hundreds of millions of years there as they have done on Earth. Why not? Until we get there and do some real exploring (not the pathetically slow and laborious robot rover style exploration) we can't possibly know. I think they would have found fossils in the mudstone and stream beds already if there has been multicellular animals of significant size on Mars. But maybe something small like Tardigrades came from there. My understanding is that Earth is though to have started off like Saturn's moon Titan, with a Nitrogen and Methane atmosphere. My guess is that both Venus and Mars did as well. An Oxygen atmosphere for a planet is possible without life. Photolysis would do it, the U.V. splitting the atmospheric molecules, and the Hydrogen floating off into space. Eventually from a Hydrogen impregnated atmosphere to an atmosphere with free Oxygen. For Venus this would happen faster than for Earth due to the relatively closer location to the sun, and a somewhat lower gravitation. For Mars this would happen faster due to the very much lower gravitation. I actually think that Oxygen in the atmosphere might have happened before Oxidative photosynthesis. Non Oxidative photosynthesis may have occurred sooner than that. Then as life form evolved tolerance to Oxygen, they may have developed Oxidative photosynthesis. As for Cyanobacteria being from Mars, I recall reading an article lately that suggested that Cyanobacteria, got photosynthesis from some prior developed organism, and more primitive organism. As for panspermia from Mars to Earth, I am guessing that even after the whole of planet Mars as a rule was devoid of surface life, there were still oasis situations, and small periods of improved conditions, perhaps from "Methane Bursts" from underground, volcanic activity may have revived the spark of life from time to time from small oasis reservoirs of life somewhat beyond what is considered the habitable period. As an oasis, you might consider algae which might live inside Antarctic rocks. Or a Antarctic dry valley lake. These situations could have existed perhaps even in a condition of an 11 Millibar atmosphere, as I have read that on Mars today if you raised the pressure to 11 mb, you could have snowfall and temporary streams of liquid water. The later wet period of Mars was supposed to be acid. Water like battery acid, which would be a challenge to life in general. However, for algae which lived inside of rocks and had snow fall on it, the acidy of the melt water might not be that bad. As for dry valley lakes, it is possible that if they were fed from an aquifer with water that had drained through an aquifer, the rocks of the aquifer might have buffered the PH of the water feeding the lake. It seems likely that the acid water might have been in conjunction with volcanic eruptions, so perhaps the major parts of living area were not constantly under strongly acid conditions. Perhaps there would have been periods of remission of some sort between volcanic eruptions. And then if there were surviving life in oasis situations, it would respread for a time across some of the Martian surface, and yes perhaps the life era of Mars may have stretched to that of the Earth. Particularly if Earth were being warmed early by a partial Methane atmosphere. Perhaps changes in Martian obliquity might provide temporary periods of habitability, as the poles on average get more sunlight with higher obliquity, which helps sublimate the CO2 ice caps and increases the CO2 pressure of the atmosphere. This isn't quite airtight as such cycles provide habitability of only tens of thousands of years at a time, but it could imply some form of oasis. There are many organisms/seeds on Earth that can lie dormant for thousands of years and then revive. Bones are something I would expect any large Mars land creatures to evolve on convergent lines, though they could presumably be even lighter. Bones are plausible as they originally evolved as mainly a phosphate source, which all organisms need. This Wikipedia article suggests water was present early on in Mars' history - about 4 billion years ago, judging by the diagrams also referenced by Spacenut. My understanding is that life is thought to have originated in water so if we are looking at a Earth-Mars exchange, we are simply talking about something water dwelling being transported through the solar system. We humans as yet have information about life and its evolution only on this planet Earth. That information is far less certain the further we look back. You cannot take the latest claim in the latest scientific paper at face value, not for some years. That is how we humans currently do science: the author gathers his evidence (such as it is), writes a paper, and "runs it up the flagpole" to see who salutes and who shoots. It takes years to sort out what might be right, and what-all is wrong (with wrong being the historical majority, although few want to admit that). That being said, the current consensus (for all that is really worth, which ain't so very much, really), is that water,. and microbial life, appeared very early in Earth's history, more than 4 B years ago. It remained single-cell microbial life confined to the ocean, for about 3 B years, through a variety of climate extremes. Then approximately 600 M years ago, multi-cellular life appeared in the fossil record for the first time. While there are a variety of opinions as to how and why this came about, there is actually little consensus about this event, remarkable as it was. In that fairly brief 600 M year interval, life went from those first simple multicellular creatures, to essentially the same amazingly complex land and sea life that we know today, by around 350 M years ago. Again, climate extremes happened during all of this. Again, there is no consensus on everything, we cannot really distinguish between cause and effect, but we know that life influences climate, and vice versa. But if Earth's history is any guide whatsoever, there is an interval of single-cell life measured in billions of years, before anything multicellular appears. Again, consensus is somewhere between lacking and imperfect on this, but Mars appears to have lost its oceans and atmosphere before this 3 B year interval could play out. Thus, while I cannot rule out weird shapes being bones on Mars, I would think it extremely unlikely that anything but single-celled life ever evolved there, before the surface was rendered essentially hostile to life. Now, there were traces found inside the Allan Hills 84001 meteorite from Mars, that looked almost exactly like what are routinely considered traces of microbial life in Earthly rocks. The two NASA scientists who reported this were ridiculed and their careers ruined. Yet, there it is, accepted or not, some evidence of early (B of years ago) life on Mars. We didn't even know there were microbes living underground inside the porosity of deep rocks here on Earth, until just a few years ago. It would appear that single-cell microbial life is more adaptable to harsh conditions than any sort of multicellular life. That being the case here, then on Mars I would very reasonably expect that early Mars microbial life would have colonized the deep rocks there, too. We'll find it when we terraform Mars, at which point native microbial Mars life will move onto, and attempt to reclaim, the surface. May (or may not) give us diseases, who knows? I agree that if there is life on Mars (on balance I think there probably is), it is most likely to be unicellular. However, various artefacts can be seen in Mars photos, which at the very least require investigation. I think it is rather amazing that so many anomalous artefacts have been identified when you consider what a narrow area of Mars has been explored. Curiosity has probably travelled 8 miles. There are plenty of places you could travel for that distance on Earth and find no signs of life of any kind, from a photo I mean. I was looking at the Thames shoreline the other day...interesting if you focus on it...everything covered in the blue-grey mud of London, in similar fashion to NASA's orange filter. At a distance it's difficult to say what's a rock, what's a brick, what's animal remains and what's agglomerations of mud, what's a piece of machinery and what's just an arrangement of rocks and jetsam. It will be wonderful when we have people on the planet to check out these things. I quite agree about the weird-looking things the robot cameras have seen. All these things should be examined more closely. Out of curiosity, if for no other reason. But it is a fact that wind and blowing sand can carve weird shapes into rocks, given enough time. A trip to the national parks in Utah illustrates that. I rather think that Mars likely had microbial life on its surface in its surface waters. It seems likely such life would have colonized the porosity of the deep rocks, as it did here. If so, there should be microbes in those deeper rocks on Mars today. We'll start finding it when we drill for ice. But that's just my own personal opinion, it's not any sort of evidence-supported theory, and certainly not established as a fact. This might be a possible means to be able to use bacteria rather than power to engineer a means for man to survive. Organisms called cyanobacteria absorb sunlight to create energy, releasing oxygen in the process. But until now, researchers thought these bacteria could absorb only specific, higher-energy wavelengths of light. The new work reveals that at least one species of cyanobacteria, called Chroococcidiopsis thermalis — which lives in some of the world's most extreme environments — can absorb redder (less energetic) wavelengths of light, thus allowing it to thrive in dark conditions, such as deep underwater in hot springs. By studying the physical mechanism behind these organisms' absorption abilities, researchers are learning more about how photosynthesis works — and raising the possibility of using similar low-light organisms to generate oxygen in places like Mars. "Photosynthesis could theoretically be harnessed with these types of organisms to create air for humans to breathe on Mars. "Low-light-adapted organisms, such as the cyanobacteria we've been studying, can grow under rocks and potentially survive the harsh conditions on the Red Planet,"
It is going to be a little hard to stay on topic here, but at least it is possibly a more quiet place to work then others currently under stress for the topic of energy for a Mars habitation for humans. To stay on topic I will state that here we are observing organisms of Earth, that possibly could exist on other worlds. We might be able to transplant them to Europa for instance, although I am not recommending it. So then as humans have domesticated other plants from nature, could we domesticate these Cyanobacteria for a profit to humans? 1) Small scale nuclear fission. (Not really part of this post or topic, but worth that much mention. 2) Solar power with large scale storage of output. (Hibernation, relying on storage, as a method to help survive a solar energy disruption). For Solar Cells, or Greenhouses, I think storage on a large scale of output may be impractical. I attempted some time ago to propose a method to link a form of solar to Cyanobacteria, and large scale storage a while ago. Something that I feel would fit well into locations such as Utopia Planetia, or Arcadia Planetia (Where SpaceX wants to land). I mention Arcadia Planetia, because of SpaceX's interest in it. Maybe it is the best place. However because I think I understand Utopia Planetia better, I will revert to it now. First of all you start on Mars with a location similar to Utopia Planetia, where the existence of substantial ice below soil is given fair evidence by scientific testing. Next, you provide a solar thermal target. We could do a solar power tower, but I instead want a hollow cone, where the tip of the cone is the target of concentrated sunlight from a cluster of heliostats. If we heat the top of the cone to red hot, then about 50% of the energy will re-radiate into the Martian atmosphere. We could live with that but I would prefer to improve on that. So, I am thinking that these things are likely already designed to not let that much long wave radiate back out of them. So put them on the apex of the cone. If you have to import solar cells, these will be lighter weight per electrical power output. Heliostats I believe can largely be built from relatively simple Martian materials. While eventually the high temperature solar cells might be built insitu, in the beginning they would be an import. The cone most likely in the high temperature areas must be composed of some metal. Perhaps the cooler parts could be of a different material such as fiberglass. So, my intention is that that long wave radiation will also "Shine" into the cone from the heated apex. They state 800 degC. What we would want to shine into the cone would be the Red and Near Infrared. Next, put a layer of water down on the bottom of the cone, for the light to shine into. It can be quite shallow. The Cyanobacteria might do ok in temperatures of somewhat below fresh water freezing, if you are dealing with brines, and up to somewhat near the boiling point of water perhaps. There will be a pressure stress proportional to the heat. But if you try to work in the area of 39 degF / 3.88888889 degC, your interior pressure of the cone will be not that much higher than the Martian ambient average of 5.5 mb. As it happens 39 degF / 3.88888889 degC is the typical bottom water temperature of an ice covered fresh water lake in the northern regions of Earth during the winter. (Where the lake is ice covered). As it happens you are in a location on Mars where their is an frozen ice-regolith "Slurry" that is: The deposit ranges in thickness from about 260 feet (80 meters) to about 560 feet (170 meters), with a composition that's 50 to 85 percent water ice, mixed with dust or larger rocky particles. Actually a happy thing that their are rocky particles and dust mixed in. You can take that and "Bound" your underground lake with berms of it. So now you have oxidative photosynthetic activity happening in the cones. During the day, the cones are likely to overheat unless you circulate water from the lake below to the floor of the cone and back into the lake. You also have electricity from the photo cells on the apex of the cone, during the day. During the night, you may evaporate something with the heat of the lake below and condense it in the cone. A little tricky. Probably use an Ammonia mix, and tubing bonded to the inside of the cone. This can generate power for you during the night, or during a lengthy dust storm. The lake water can contain O2 dissolved to get you though the dust storm. If the ice layer is 110 feet thick 33.528 Meters, then potentially the water could contain 5 times the Oxygen that water on Earth contains. And of course you could have a tank farm on the bottom of the lake, to hold compressed consumables like Oxygen and Fuels. Chambers with water which is of a much higher temperature, if you like. Well, we don't intend to dance about in bathing suits on the surface of Mar anytime soon. Other than locations on Earth or the bottom of a lake at Utopia Planetia, bathing suits are not at all sufficient protection. It is tough, but there is a need for technology, and I have just proposed an alternative. As I have stated before, I am in favor of a generalized plan. Further establishing a human settlement on Mars will be like having a baby. You can't just have a baby and throw it into a snow bank and expect it to fend for itself. It will take time and effort on the part of the human race to make it possible for humans to make Mars into a hearth place for our so called civilization. If this machinery can host domesticated Cyanobacteria to provide needed production on Mars, then it is worth a look I feel. I would be really pleased if I could get a direct reply on this material, instead of someone diverting the conversation with something else.